Two Factions: The two factions that formed after WW III are the Consortium and the Empire. Both wield an arsenal of deadly advanced warfare technologies, and use them relentlessly to take control of the last, precious resources the world has to offer. Four classes: Each faction’s army provides a choice of four classes. On entering the game, by using an armoury, or while waiting to re-spawn, you have the opportunity to choose and change your desired class, or weapons load-out. Exo: The heaviest of all classes, it demands respect with its heavy machine gun and almost unlimited supply of bullets. What the Exo lacks in speed, it makes up for with overwhelming fire-power, against both infantry and structures. Assault: Assault players aren’t your common foot soldiers. Armed with a number of kits that cover all tactical roles, Assaults are the most versatile combatants in the game. Moderately armoured, with powerful long range weapons, they are a force to be reckoned with, especially when they use their Tactical Visors to spot cloaked Stealths. Stealth: The lightest player in the field is quick on its feet. The Stealth’s special ability is a light refraction cloaking mechanism that renders them invisible to the naked eye, and allows them to take down any enemy with razor sharp knives, or from a distance with a sniper kit. Beware though, as Stealths are true glass cannons, and will easily perish in open combat. Support: The support ensures that both structures and players remain upright, with its engineer and medic kits respectively. In combat, a support can cripple enemy fortifications and troops with EMP and gas grenades, and if the situation calls for it, the flame-thrower weapon kit can burn a path straight through the toughest enemies. RTS Commander: As commander, you play in RTS view. Commanders are set with the difficult task to expand their base and guide their troops to victory. Manage your team’s resources, balancing expansion with repair costs, troop support and fortifying your base. Direct your troops through enemy ambushes and emplacements, and use squads and control groups to coordinate devious attacks on the enemy. Research advanced weapon kits to take your enemies down, or devastating new turret types to stop them dead in their tracks. Conquer your enemies with the combined might of your advanced abilities and well-organized troops. Full-featured game modes: Nuclear Dawn sports several game modes that do more than rehash the old capture the flag thing. There are, in fact, no flags to be found in the nanite-blasted cities of the future. Explore a whole new world of devastation and survival, with a gaming experience that goes from simple deathmatch to advanced, team-based warfare. 32 Player Battles: It’s hard to do apocalyptic on a small scale,so we’ve made sure that the full Warfare mode supports up to 32 players,16 on each side. It’s a big world out there, and it’s teeming with enemies. 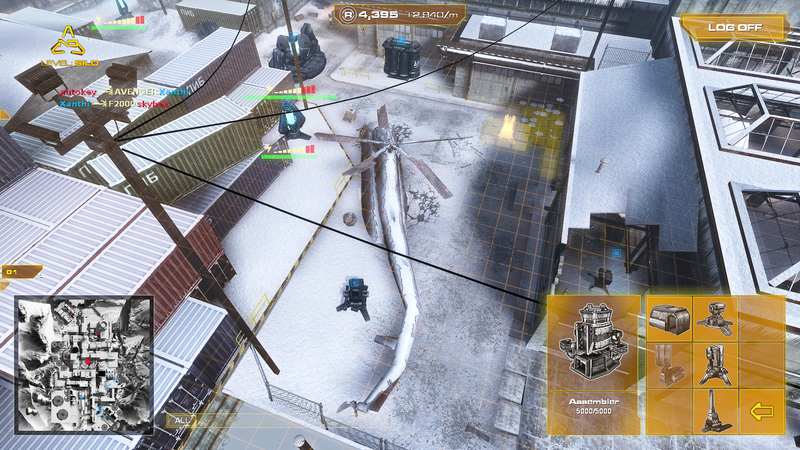 Squads: Players are able to join squads, and group up with comrades in units of 6. Squads can be assigned tasks by the RTS commander, to take on enemy targets, capture resource points or defend certain positions. As the squad performs the tasks set by the commander,they will gain both ranking and experience points towards their achievements. Downtown is based on New York. Visitors will find themselves admiring large swathes of neglect and devastation, as the abandonment and years of urban warfare decimated the once densely clustered skyscrapers. Players that shy away from open, brutal combat will enjoy Downtown’s conveniently located sniping and vantage points. If you’re not afraid of large environments that require concentration and skilful deployment of resources, then Downtown is the map for you. Hydro hails from the wasteland of former Soviet Russia. Already a giant industrial complex before any of the events that led to the Nuclear Dawn, this once-idyllic dam is now the stage for some of the most intense combat action of the late twenty-first century. The sprawling complex at the feet of the Vyksa dam is not for the faint of heart. Its extremely varied combat conditions require quick reflexes and an ability to completely overhaul strategic planning that escapes most commanders. Oasis is set amongst the broken buildings of Dubai’s shining high rise tributes to power and riches. As the only hospitable location in the entire desert region, its streets are hotly contested, but show no mercy to the unwary soldiers and commanders that ignore the honeycomb of passages and routes in and around all major resource points. Metro is based on Tokyo with its skyscrapers and intricate, layered architecture. The level’s seemingly small size and simple layout will soon disillusion commanders unable to take vertical combat into account, as close quarters combat devolves into slaughter from vantage points and underground metro station passages. Clocktower is an extensive level based on London. Wide avenues and long distances will tax commanders to provide cover and support for their soldiers, all the while monitoring a multitude of routes to spot incoming attacks. Soldiers, for their part, will have to learn to make use of what cover the streets provide, lest they fall prey to long-range weapons. Silo is a map which lies in a snowy valley, inspired by Syrdakh. Its cold, dark and gritty atmosphere suits the game-play that will have players and commanders alike on edge, as the buildings themselves are teeming with enemies. Learn to step off the beaten path, and take the fight to your enemies through warehouses and side streets, or die. Ranks: Based on real world military rank progression, Nuclear Dawn features many a star, stripe and ribbon. Every kill, save, assist, capture and well-placed explosion will fuel the player’s progress through one of the toughest ladders in the world. Progression in Nuclear Dawn becomes exponentially more difficult with each level, and reaching the coveted Colonel and (for those who truly have no life)General ranks will be a matter of pride, not of fact. Achievements: With a tiered achievements system that unlocks new weapons and abilities based on class gameplay, it will be awhile before players unlock their favourite classes’ full potential, andeven longer before every secret, power-up and hidden weapon is in their hands. Unlocks: While ranking up and gaining achievements you will unlock new gizmos to customize your kit load-out to provide you with even more ways to engage your enemies. Steam Cloud to save your options and preferences, to have them just the way you like from any computer and reinstall. Steamworks to power achievements, ranks, progression,account unlocks and community features on your Steam profile, because bragging is good for the soul. Social Gaming and full contact browser integration allow you to find your friends and join their games without having to deal with server names or IPs. Chat, or just plain talk, with your team mates in between games, or across several servers – the more the merrier! Cross Platform Support. With the Steam Play upgrades to the Source platform, you will be able to play Nuclear Dawn on both the Mac and PC, to play against users from both worlds, and to access both versions of the game from a single purchase.